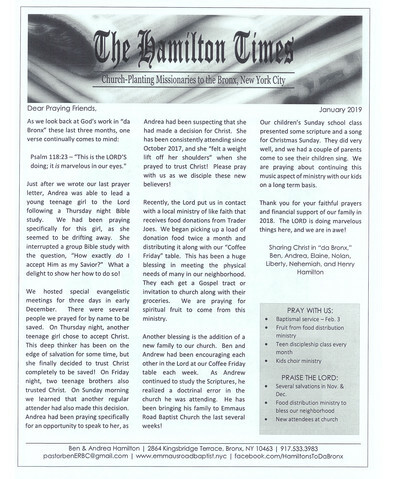 In January we sent a prayer letter, but we have a couple of updates to share with you. 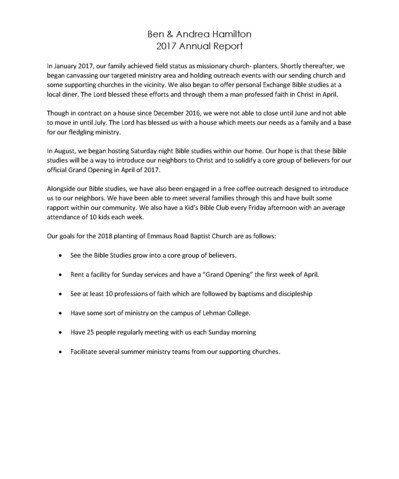 In January our church adopted it's first budget. Ben preached on Biblical giving and the people responded well! We are excited to take this first baby step toward our goal of financial independence! On Feb. 3rd we were able to see four people baptized. Three of them are teeenagers or young people who recently received Christ. Two sisters have been faithfully attending for nearly a year, and we were excited to finally have their father visit us for their baptism! Continue to pray for Julian's salvation! We also baptized Johanna Teel. She and her husband recently left a different church over a doctrinal error. Andrew has been stopping at our coffee Friday table for a long time, and we have enjoyed the fellowship in Christ. 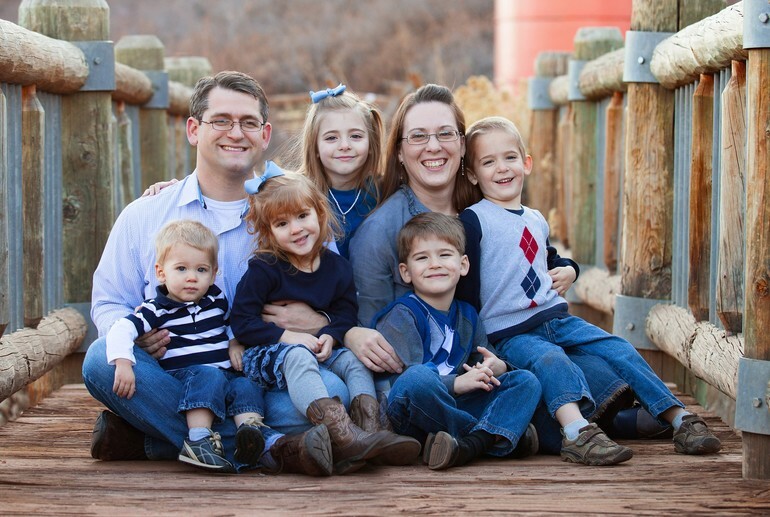 The Teel family has decided to join Emmaus Road Baptist Church! How exciting to have a complete family join us, and to have another man for service in the church. We provisionally voted to accept them as members pending Johanna's baptism. Tomorrow (Sunday, 2/10) we will officially have them join our church! Please continue to pray as we disciple several teenagers. We also have two families who are making steps to get their lives right with God, but they need courage and boldness to do what is right! Thank you for your continued prayers and support of God’s work in the Bronx. He has continued to bless us and confirm to us His calling. 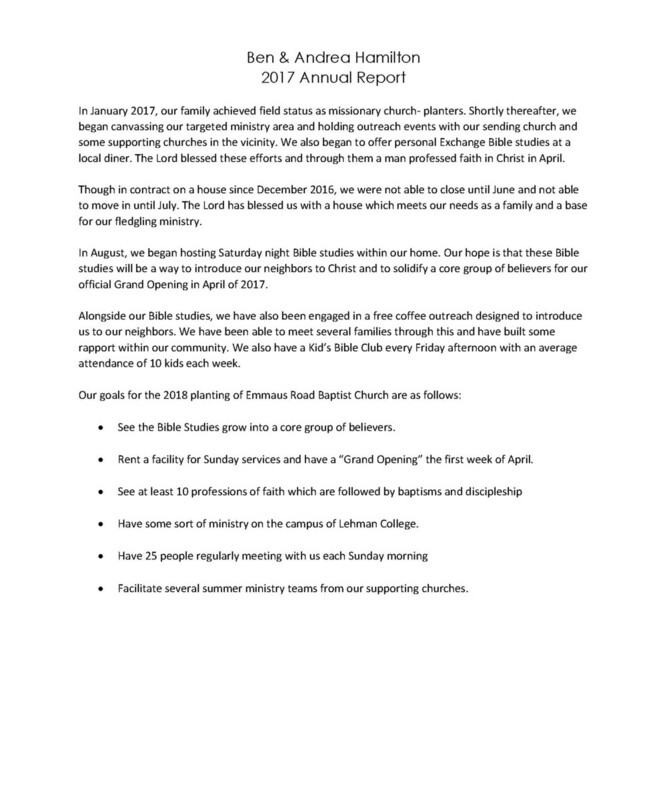 Throughout the end of summer and into the fall, we have continued to see between thirty-five and forty people in attendance on Sundays. Most of these have never been taught Biblical truth and many have not yet accepted Jesus Christ as their Savior. As they continue to come, it has been exciting to see God begin to open their eyes and increase their understanding. As we get to know them better and better, our desire grows stronger and stronger that they come to know our Savior! In the month of August, we were blessed to have a third and final summer mission team assist us. All three groups were a tremendous blessing and represented Jesus Christ well. Through the ministries of these groups we were able to hand out thousands of invites, host three vacation Bible schools, and leave positive impressions for Christ and Emmaus Road Baptist Church throughout our neighborhood. We have had several visitors as a result, and are in continuing contact with many others. In September, we were blessed to have two ladies join Emmaus Road Baptist Church as members. Anais previously attended our sending church in Brooklyn, but felt that God was calling her to serve Him in the Bronx. She had been coming faithfully from the very beginning, and we are very thankful for all of the help and encouragement which she has been to us. She truly views it as the ministry which God has given her, and she makes the sacrifice of riding nearly two hours on the train each Sunday morning to get to our church! Miriam, had been saved, baptized, and discipled in the Bronx previously, but had not been going to church for some time. As God would have it, she lives on the same street we do and was one of the first persons which we met in the Bronx. She has since recommitted to following the Lord and is a great blessing to our new church. With the start of the school year, we also restarted our coffee ministry to the parents of children who attend the elementary school just two doors down from us. The Lord continues to bless this ministry and several people have promised to visit our church soon. Since I see them every week, I believe that eventually they will show up! We have several activities planned for the upcoming holiday season, but I would especially ask your prayers for evangelistic meetings which we have scheduled for the December 6-9. We would like to see new visitors from our community, but we would really love to see God move in the hearts of some who are already attending that they trust fully in Christ as their Savior! September was an exciting month for us. On the last Sunday of the month, we accepted two new members into Emmaus Road Baptist Church! Miriam had been a member of a good church several years ago, but had walked away from the Lord for a while. She has been faithfully attending, and "acting" like a member. She wanted to join the church, but was afraid of being hurt as at her last church. She was convicted when Ben preached about surrendering everything to Christ, and she came to join our church! She is always an encouragement to us. She knows her Bible well, and she talks about the Lord constantly! Anais also joined the church. She is a college graduate from our sending church in Brooklyn, NY. She rides the train for two hours one way to come help us on Sundays. She wanted to join our ministry officially. She has been a blessing since the first Sunday! We are preparing for a short trip to visit a supporting church in Ohio this week. We would appreciate your prayers for our safety. It has been two years since we made a long trip like this! Also, On October 2, Andrea's grandfather passed away. She was very close to him, and we are driving to Colorado for the funeral directly from Ohio. Please pray specifically for unsaved family members Nathan, Akemi, Michael, and Nicole. Andrea's grandfather was a believer, and a very godly man. How wonderful it would be for thses to accept Christ at his funeral! We had a busy August with our third mission team of the summer visiting. The group from Gunnison, CO helped us put on a 3-day VBS program called Kingdom Chronicles. We had about 30 kids each night, and through this even we continued to build our relationship with several families on the block. The group in Gunnison donated their own VBS penny offering to us for our children's program, and we used the funds to purchase some follow up materials for the kids who attended VBS. We are now in the process of visiting the families and delivering the gifts. So far everyone has been very grateful! We had two new visitors as a result of the VBS outreach and the invitiations and water bottles (with our church information on them) distributed by the mission team. Though the last two weeks' attendance was low because of last vacation weekends before school resumes, we have been averaging high 30's for Sunday attendance. Today one of our members had their fourth child born. This is the first baby to be born to "our church" and we are very excited for the Espinal family! We also had one other lady express a desire to join the church. Please pray for two ladies, Miriam and Natalie, who attend our services regularly. They are both experiencing knee problems and both work in the public school system and have to do a lot of steps daily. Thank you again for your continued support and your prayers. Thank you so much for your prayers on our behalf. We are eagerly anticipating April 1st as we will have our Grand Opening Sunday service on that date! The Lord has provided a space in the public high school for us to rent. We are transitioning our Bible study group to meeting on Sundays in that space on March 25th, so that we can see how things work out and what may need to be changed before our Grand Opening. We have been busy purchasing needed items since we will have to carry everything in and out of the school every Sunday. The Lord has provided funds for a small trailer which will greatly help in this process! We are praying for 50 people from the community to visit Emmaus Road Baptist Church on April 1st. 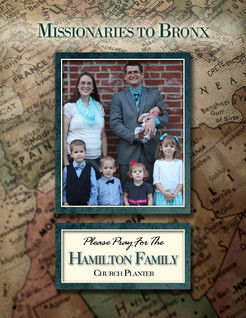 We would covet your prayers with us on this matter, and we look forward to telling you what God has done! As a personal prayer request, we have had two major issue with our house and we are in the process of replacing our furnace and our roof. There are a lot of details that go along with this, and we are in the middle of preparing for Grand Opening, so there is a lot going on at our house! Serving the Lord in "da Bronx,"
We want to wish you a very Merry Christmas! We are excited to be celebrating our first Christmas in the Bronx. We are so thankful for your faithful giving and prayers which have enabled us to be here in “da Bronx” planting Emmaus Road Baptist Church. Thank you so much for your continued prayers and financial support on behalf of our family. 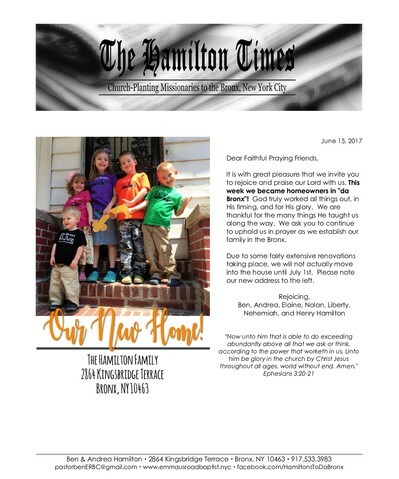 We are excited to finally write to you from our mission field! We were able to purchase a house in the Bronx on June 12th, and after about a month of necessary renovations, we moved in on July 15th! We have been busy unpacking and settling in, as well as completing some of the renovations. The house which God blessed us with is in an ideal location for reaching our target neighborhood of Kingsbridge in the Bronx. We have a large living room where we have started holding Saturday night Bible studies at 7 p.m. Please pray for increased attendance and for people to be saved. We are studied the book of John. The house is two doors away from a public elementary school, and we look forward to holding a Bible Club for the children on our patio when school resumes this fall. The Lord has allowed us to meet many of our neighbors and other people in our neighborhood. We are building relationships with them and many have been invited to our Bible study. We are continuing discipleship classes with the gentleman who was saved this past spring. Pray for his family to follow him in salvation, and for his continued growth. We are also pursuing several leads for possible meeting places for Sunday services. Please pray that God will lead us to the right facility and for the price to be affordable!